“While I was texting with my friends using Viber, I accidentally tapped the Delete button, and then the existing messages have gone. Does anyone know how can I recover Viber messages from my Samsung Android phone?”, cried Dora. More than 200 million Android users make calls, send messages, share photos and videos by using Viber. I guess Dora is not the only one who encountered the trouble of deleting Viber messages accidentally. What’s worse, similar to WhatsApp, the Viber doesn’t keep your chat history in its serve, which makes Viber message history recovery more difficult. Don’t worry, that’s why we write this post to help you get this around. Read on to learn the following 4 ways to backup and restore deleted Viber messages from Android. In most cases, data stored on your Android device may be lost due to some uncontrollable reasons, and you may want to learn how to recover deleted Viber message, photos, contacts, call history on your Android device while no backups available. In this case, we recommend you to get help from this third party data recovery program. 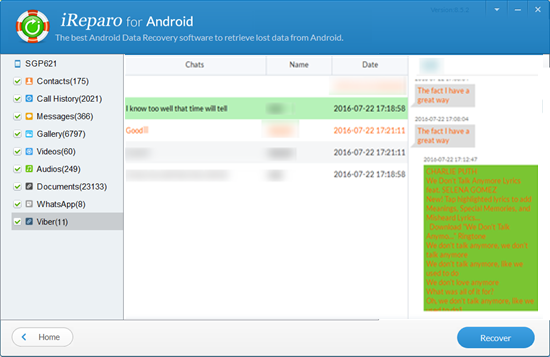 Android Phone Recovery is a great data recovery tool to retrieve Viber messages on Android. 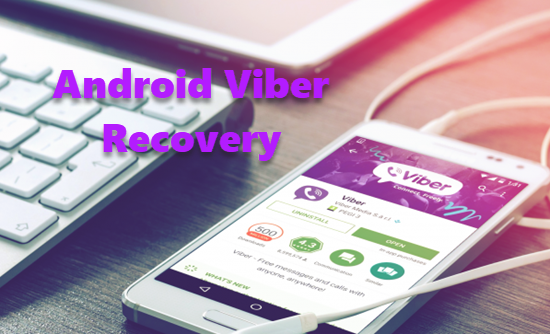 But it is not limited to recover Viber chat history only, it can also restore contacts, text messages, photos, videos, WhatsApp and more files on Android device with a few steps. It is compatible with a broad variety of Android smartphones and tablets, so that you are able to apply it for Samsung Galaxy Recovery, LG Data Recovery, Huawei Data Recovery and more. Step 2. Scan and access Viber messages stored on your phone. Step 3. Preview and recover deleted Viber chat history on Android. Viber offers two built-in options to save your chat history with Email and Google Drive. 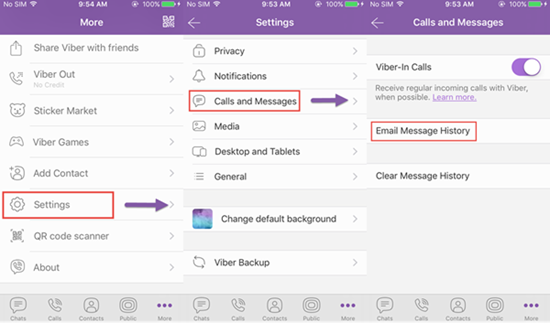 You can easily make use of these two features to keep your Viber conversations safe. If you wan to use Google Drive to backup Viber, please go directly to Option 2. Step 1. Open Viber app, and tap the three-bar icon to display more options. Now you need to find out the Settings option from the list and select Calls and messages. Step 2. Tap on the Email message history option and then a list of applications will pop up and you can elect one of them to send the messages. Here you can click Email option, and then type in your email address and password to enter your account. Step 3. After your account is set up and ready to use, you can enter the email address again to receive your Viber chat backup. Given that you have sent the Viber messages to email before, you just need to log in your email account on your phone and download the attachment to your phone memory. After that, you can access to your Viber chat history on your Android. However, these backed up Viber messages cannot be restored back to your Viber directly. Step 1. Open Viber, and navigate to Settings -> Account -> click on Viber Backup. Step 2. Tap on Back up to start the backup process. Here, if you didn’t selected the Google account before, it will ask you to add one. To complete that, you should go to your phone Settings to add your Google account. Step 1. Similarly, go to Settings -> Account -> click on Viber Backup. Step 2. 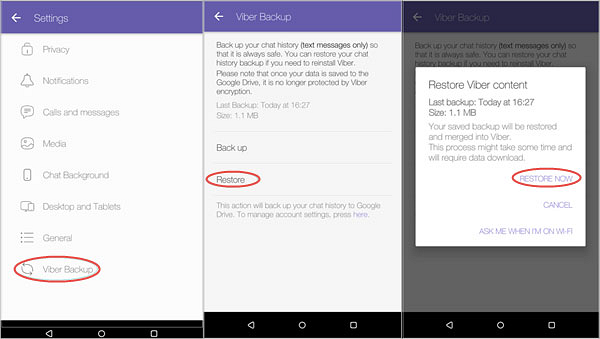 On Viber Backup page, you can see two options, Back up and Restore. Here you need to click on Restore and then hit Restore Now to confirm your option. Tip: You can also try to restore WhatsApp backup from Google Drive to Android/iPhone. Android Viber Transfer can easily backup the current Viber chat message from Android to computer Besides, it allows users to restore the Viber backup from computer to any Android device. Step 1: Run this Viber Transfer tool on your computer and connect your Android Phone to computer with USB cable. Please remember to enable USB debugging on your phone. Step 2: If a message pops out on your phone screen, please click “Back up my data” button without entering password. Then back to the software on the computer and click “OK” to continue. Step 4: Backup all Viber Chat History from Android to Computer. Under the Devices list, right click on your desired Android phone to backup Viber from, and then choose “Backup Messages” to backup all the Viber chats. Or you can only backup a single contact by right-clicking the contact name under your phone device and then choose ”Backup Messages with this Contact”. Step 5. Select a location to save the Viber chat history on your computer. Step 1. Connect Android to computer. Step 2. Under the “Local Database” list, select the backup file. Step 3. Right click the backup file and hit “Transfer Messages from Database to Android”. Or you can right click a specific contact name under your phone name, and choose “Transfer Messages with this Contact to Android” to restore a single Viber conversation. Step 4. 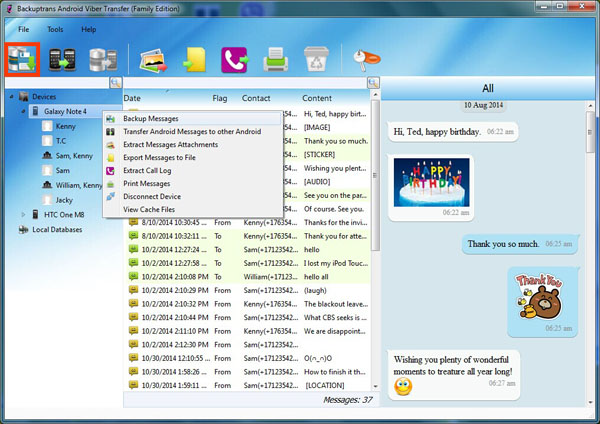 Then the program will show you a pop-up window asking you to select an Android device to restore Viber messages to. Select and confirm it.